India’s first 3G Mobile service operator Mahanagar Telephone Nigam Ltd (MTNL),toady announced ground braking Value Added Services for its next generation 3G mobile service subscriber of Delhi and NCR telecom circle in association with Spice Digital a leading Mobile VAS solutions provider. 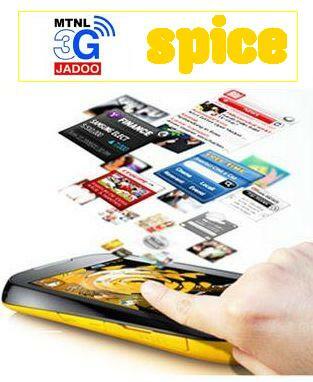 This launch makes MTNL and Spice Digital the first 3G Mobile Video VAS provider in the country. MTNL introduces Video on Demand, Live Aarti and Video Conferencing whereas there are services concentrated on the urban youth like Video Fun, Video Handy Cam and Video Greeting for its 3G Jadoo Mobile service. Speaking on launch of 3G VAS for Delhi circle, MTNL CMD Mr. RSP Sinha said “We have a mobile customer base of 44 lakh in Delhi and Mumbai at present. We hope to touch 50 lakh base by the end of the current fiscal out of which we hope three lakh will be from 3G services,”. Presently, MTNL has 2,00,000 (Two lakh) 3G Mobile Service subscribers in Delhi and Mumbai circles out of 44 lakh 2G GSM Dolphin/Trump subscribers. MTNL Next-generation mobile services or 3G services enable its subscribers faster downloads and video streaming among other value added features. Video on Demand: This service allows the user to traverse a wide variety of categories through the MTNL video library. The service is available on both pay per usage and subscription models. User can dial in anytime and enjoy the latest music, bollywood updates, celebrity interviews and movies. User can even dedicate that particular video to any other subscriber for more usage trends. Live Aarti: This service allows end users to connect and watch Live Aarti from various geographically spread religious locations. The current offering includes Live Aarti from Tirupati Balali and can be watched by simply subscribing to this MTNL 3G services. User can avail this service from any location just by dialing a single shortcode. Video Handy Cam: This service is based on User generated content which allows users to create and record their own videos against the account created with subscriber’s mobile number. User can view the latest recorded video and finally confirm to add that video into his own personal library. User recorded video can also be added into public library which will be accessible to entire set to subscribers for viewing, but prior to public access of this user generated content, administrative moderation will play an important role. After due checks and authentication by the monitoring team, the Video shall be available for public access. Video Fun: This service is a big innovative drive that allows user to record his/her own voice and embed the same in pre-existing video clips. First, users have to select a particular video from the existing list and finally use that for modulation and add user generated voice or video stream. This allows users to generate “user customized video clips” with their own voice or video overlapped on the preexisting video clips. Users have the option to dedicate his own generated clips or save those in personal library. Video Greetings: This service is very useful tool as a “Reminder Box” and sending automated greeting video messages. User can schedule any of the greetings video clips and those will be forwarded to the other party at predefined timestamp. It has a small library with video clips of occasional and regional celebration. Dr. Abhinav Mathur, Chief Strategy and Technology Officer, Spice Digital Ltd. said, “It is a matter of immense pride for us to partner with MTNL and become the first VAS provider to commercially launch 3G VAS products in the country.